Self contained turntable stereo system, with Cassette player, SD and USB ports. AM/FM Stereo Radio with built-in speakers. 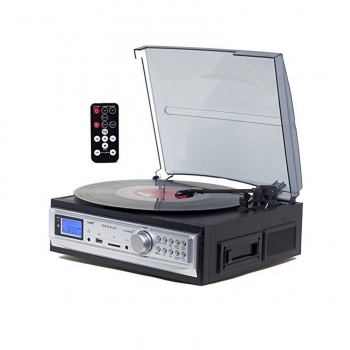 MP3 encoder lets you take your favorite records on the road with you. Transfer your favorite records into MP3s using the built-in MP3 encoder. Just attach a flash drive, or insert an SD card, and you can start recording your favorite tracks to be listened to later on your computer, MP3 player, or other digital music device, all without having to attach a computer to the turntable.